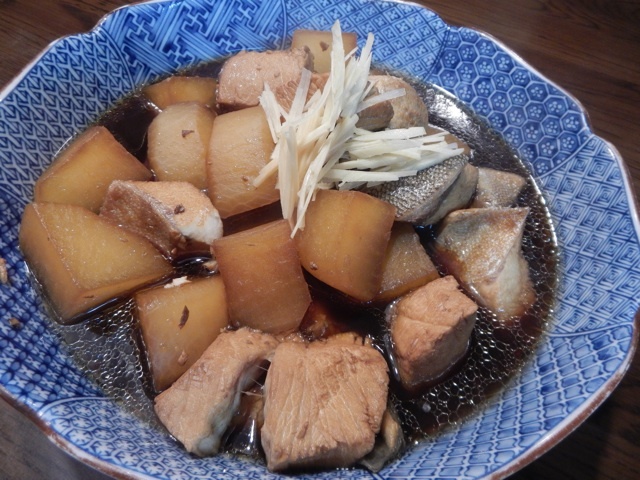 Buri is simmered with daikon in a sweet soy broth until both are tender. Himi Port in Toyama famous for winter kanburi. These kanburi are at the wholesale fish market which is open to the public. Kanburi at the retail fish market an hour later. Prices range from $100 to over $300 USD. You can purchase a kanburi and have it sent to anywhere in Japan. Kanburi sashimi breakfast at the restaurant on the 2nd floor of the wholesale market. This restaurant is open to the public. 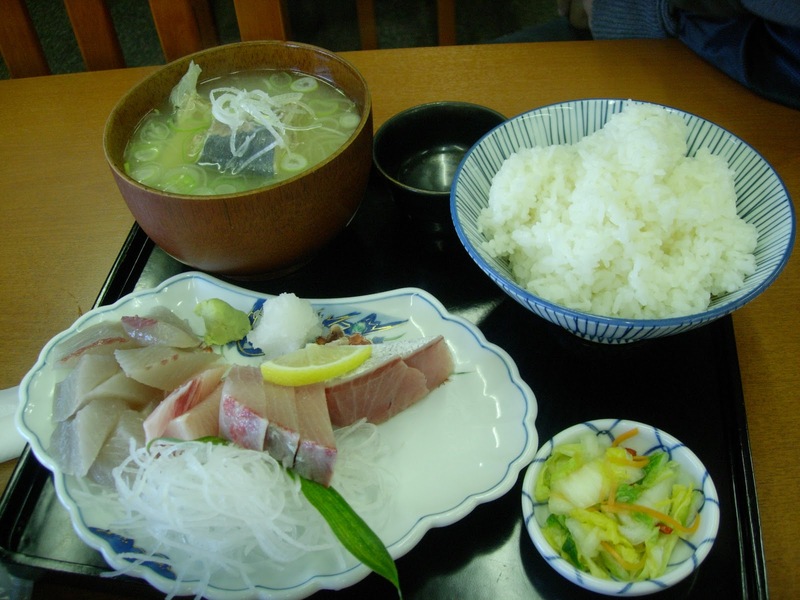 The miso soup in both meals is made with fish heads and bones for a meaty broth. 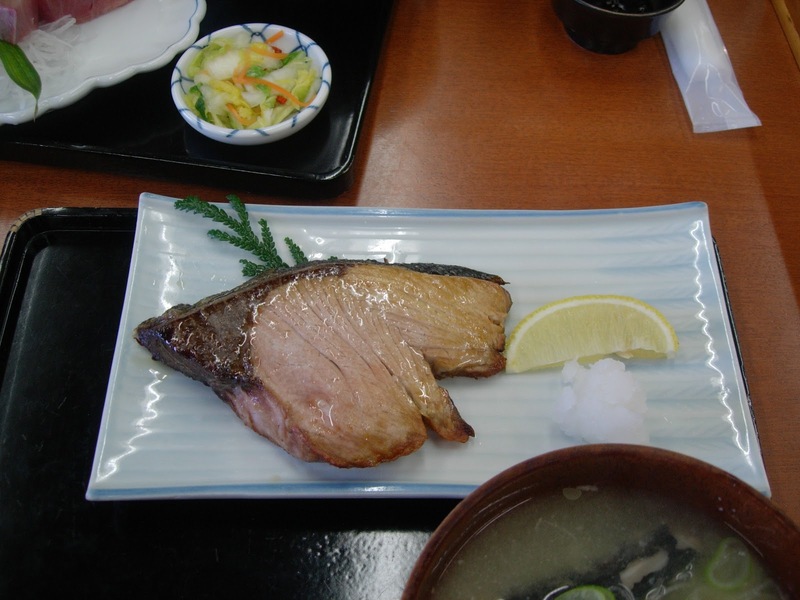 Yellowtail (鰤 Buri, Seriola quinqueradiata) is a very popular fish in Japan for sushi and sashimi. There are many recipes to enjoy this precious protein gifted from the ocean. The wild fish swim up from the south to the north along the main island of Japan. Yellowtail eat a lot of seafood to obtain as much fat as possible in their flesh for energy to bear the cold waters in the north. The best season is from December to February, when the flesh color turns gradationally pink to white. In March, it ends its peak season after spawning. Although the wild fish season ends in March, farmed fish is available all-year long. 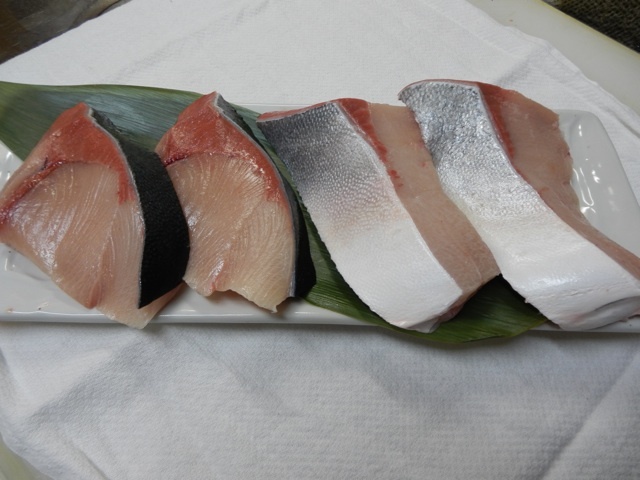 Farmed yellowtail has white flesh with a lot of fat and it is usually delicious. It is called hamachi (farmed yellowtail in Japanese, wild fish=buri, farmed fish=hamachi) and exported all over the world to fill the demand for sashimi, sushi, and grilled as teriyaki. Wild fish in winter gets as fatty or fattier than farmed fish, and its gorgeous flavor is unbelievably amazing. If you have any chance to try wild fish sized more than 10 kg, from Hokkaido (Tenjo-buri) in Nov to Dec, Ishikawa (Noto-buri) and Toyama (Himi-buri) in Dec to Feb, you must try it. 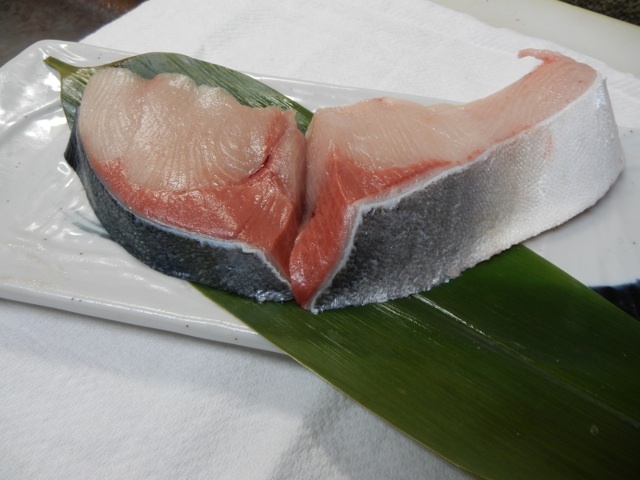 You can find frozen yellowtail fillets in the US or other countries, but there is no frozen yellowtail distributed in Japan, so when you buy steaks or sashimi loins in the local supermarkets, they should be fresh. Here are some tips to help you when shopping for yellowtail. Yellowtail has different names depending on its size. The name also changes regionally. 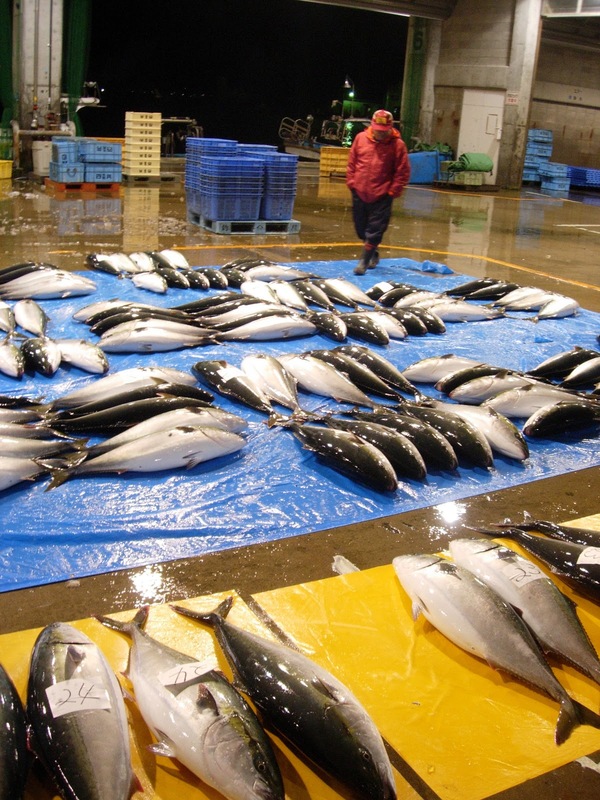 The label does not need to show if it is wild, but labeling is required for farmed fish. So If you see the sign ‘養殖’ (Youshoku, farmed) on the label, it is a farmed fish. Retailers sometimes label the fish as ‘天然’ (Tennen, wild) on the package for wild caught fish, usually with a sticker. If you can tell if the fish is wild or farmed without seeing the sign, it means that you have completed the first step to becoming a fish foodie in Japan. The label must show ‘刺身用’ (sashimi-you, for sashimi-grade fish), ’生食用’ (namashoku-you, if it can be consumed raw) or ‘加熱用’ (kanetsu-you, for if it needs to be cooked). It is better to check the labeling before you buy the fish. Though it is easy for Japanese people to recognize the usage by checking the portion appearance, but just in case, you should check the label. The sashimi-you ‘刺身用’ label does not mean how fresh the fish is, it just means that the fish was cut under careful hygiene standards for sashimi, using sanitized cutting boards and sashimi knives (yanagiba knife), and the freshness is suitable to consume as raw. 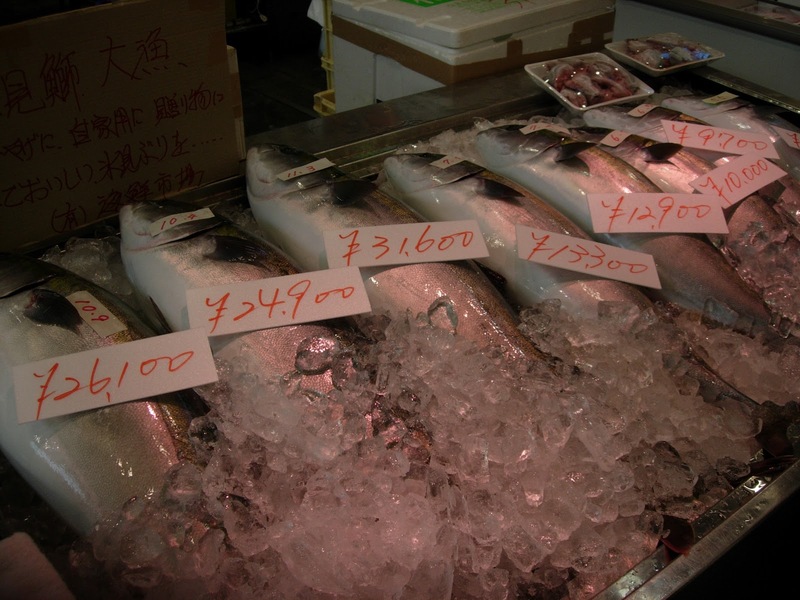 So kanetsu-you ‘加熱用’ labeled fish can be as fresh as sashimi-you ‘刺身用’ labeled fish. When they cut steaks, they usually use filet knife (deba knife) which is not usually sanitized very often. It is easy to know which part of the fish that the steak cuts come from. You can check the skin color, if black, it is back loin (less fat) and if white, it is belly loin (fattier). Firstly, filets are roughly divided into 2 loins, back or belly. But when the loins are too big to sell, they are cut into upper (head side) portion and lower (tail side) portion. Personally I love the fatty portions, and chose in this order: 1. upper belly 2. upper back 3. lower belly 4. lower back. Usually it is sold without the skin, so that you should learn to know which part is which by the appearance. Another amazing informative entry. This article adds clarity to the abundance of misinformation regarding this tantalizing, delicious fish. Thank you very much! Arigato! 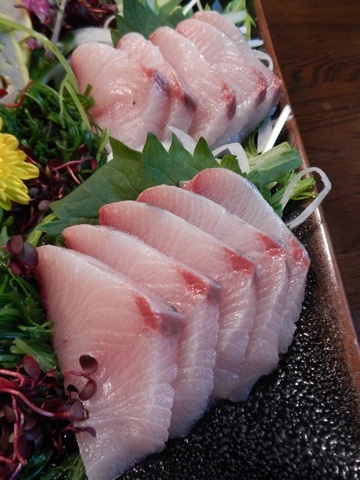 Are you eating any buri this time of year?